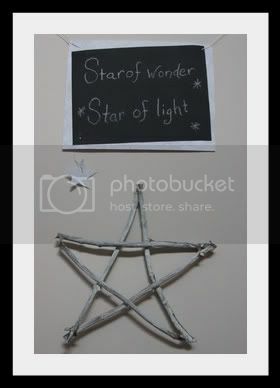 Kara's Creative Place: Star of Wonder, Star of Sticks??? So you know that I have been working on my entry way and last week I put up the pallet shelves and my wooden Korean word for "Family" Sign. 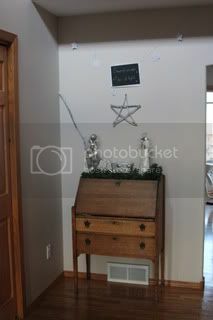 Well the other wall of my entry way was decorated for Thanksgiving so it looked like this. 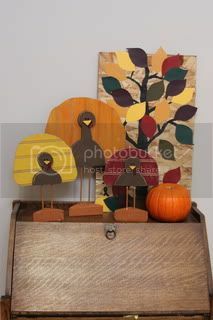 Thanks to my bead board Turkey Project, and my Paint Chip Tree, but it was time to put them away for the year. I plan on putting a large family photo on the wall there eventually but since our last set of family photos was taken last February, I plan on waiting until this February to get new ones taken and then I will get a really nice one framed and up on the wall. I decided instead of decorating my mantel this year I would leave the usual stuff up there and hang the stockings and put up lighted garland. It looks fine and will be less work in the long run finding a place for the things that are usually there. 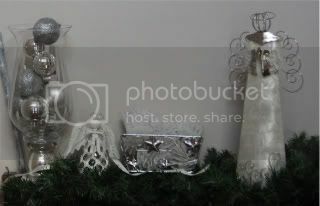 This meant I had the items I usually use on the mantel up for grabs to use in the foyer. The desk needed some decorations so I grabbed all my silver stuff and put it there. 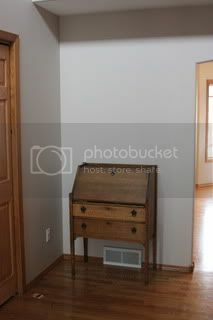 But the wall was still blank. Then I found this post from another crafter and when I clicked on it I knew I had my answer. A free project. 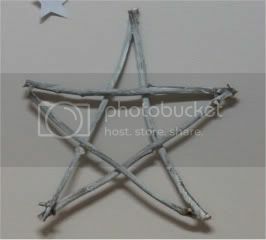 A Star of Sticks! Well free for me anyway because I had the things I needed like white paint, a glue gun and some paper and string. She didn't use the exact same things, but we crafters always say, use what you got. So I went in the garage and grabbed some sticks. We save our sticks when we trim our trees to burn in our fire pit. My husband usually cuts them down to fit in a five gallon bucket. So I was limited to a short length. I would have made it bigger if I had larger sticks. I did have one larger stick so I panted that too to prop on the side like the original decorator. So I found 5 sticks that were the same length, then lightly rubbed on some white craft paint with a paper towel. I only wanted a light layer. Then glued my sticks together with a glue gun. I would have added some twine on the corners, but didn't have any. So went without. 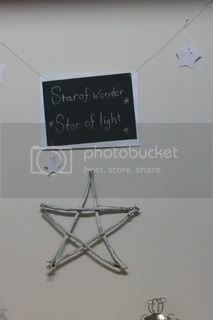 Then I made a sign out of scrapbook paper and wrote "Star of Wonder, Star of Light" out of chalk just like the original decorator had on her sign. Why mess with a good thing right. 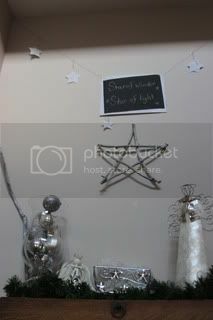 I hung mine with some silver chord I had on hand and also added stars out of scrapbook paper. It fills my empty wall for now and was a fun project. I'm a slow responder but THANK YOU for showing this to me and I also SO appreciate the references back to my site. This post made me super happy. I'm so glad you liked it. :) You complete setting turned out amazing! I love how you rubbed paint on your star instead of spraying it. It all looks so beautiful.